Status quo forecasting is sometimes very easy to do. For example, if you predict that tomorrow’s high temperature will be the same as today’s high, your estimate will be close to the actual high much of the time. Predicting volatility Exchange Traded Products (ETP) prices is not so straightforward. The VIX futures that volatility ETPs like VXX, SVXY, UVXY, and TVIX track are similar to stock options in that they have a time value that usually decaying. Generally the longer the VIX future has until expiration the higher its price. If you plot VIX futures prices versus time until expiration the chart often looks like the one below from VIX Central. 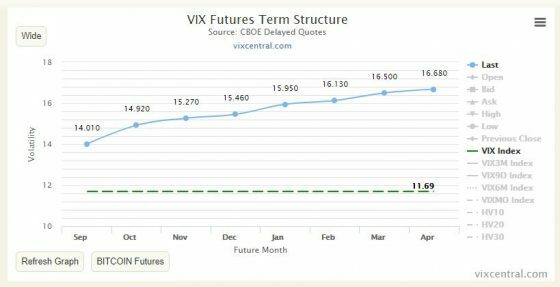 This curve is called the VIX Futures Term Structure. The term structure curve can be relatively stable for significant periods of time—which raises the question of whether we can use the term structure to predict volatility ETP prices. Assuming the VIX futures term structure is stable (including the Cboe’s VIX spot price) allows us to project how much decay/gain is “built-in” to the prices of the long/inverse volatility ETPs. This information can help us set strike prices for option strategies, set limit prices, and determine risk/reward parameters. More than 80% of the time, the VIX Future Term Structure is in a configuration called contango, where futures with more time until expiration are priced higher than the “spot” VIX price. 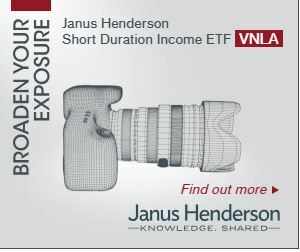 While in contango, decay factors on long volatility funds like VXX, UVXY, and TVIX can be considerable as can the boost factors on inverse funds like SVXY, VMIN, and ZIV.